If you think coding a dice in Python is hard you are complete wrong! You don’t need 800 lines to do it, 5 is more than enough. Welcome everybody! Today we will make a simple dice simulator from scratch. If you are just starting to code, this tutorial is for you. Lets start by opening Python. 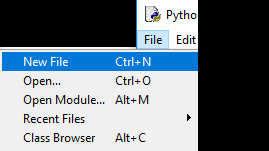 Go to Windows main menu and select IDLE. Now, lets click File >> New file. Here is where we will write our code. First we import the library that allows us to choose random numbers. Now, we generate a random number and save it in a variable. We will call it selected. This library has a function called randint(). The randint(min number, max number) requires 2 parameters (the lowest number and the highest number between we will pick our number randomly). In this case, our dice goes between 1-6. In my case, the random chosen number was 5. If we close the console and run the code again pressing F5, the chosen number will be different. If we run the code again, we should see a little message and the random number. Congrats! but we can improve it even more. Our code runs only once and then it close. What we need is to keep it running. To accomplish this, we will used while. If you run this code, you will see that the dice will keep rolling as long as you press any key. We could keep improving the code even more, but lets leave it here until another day. This example is great to start coding in python. Hope you liked it and see you soon! If you have any trouble, leave me a comment.